When teenage waiter Evren serves customers at Istanbul’s Smile Cafe, he always has one request. “I say to every customer: please don't pity us. We are different, we are overcoming boundaries,” he told Euronews. Like other staff at the cafe, Evren has Down syndrome and refuses to let the genetic disorder stand in the way of him working or socialising. The cafe opened in 2016 in Istanbul’s Altunizade neigbourhood as part of a project carried out by the Üsküdar Municipality. It currently employs 10 people with Down syndrome. “Our aim in this project is to help reintegrate people with Down syndrome into the society. We wanted to create awareness on this issue,” said Üsküdar Mayor Hilmi Türkmen. Evren supports his family with the wage he makes at the cafe and dreams of one day buying a car with his savings. His colleague, Emrah, lives in the city of Sultangazi and crosses the Bosphorus strait independently each day on his commute to work. “We provide a great service here, we teamed up with great friends… We have done such good things, I am extremely happy,” he said. 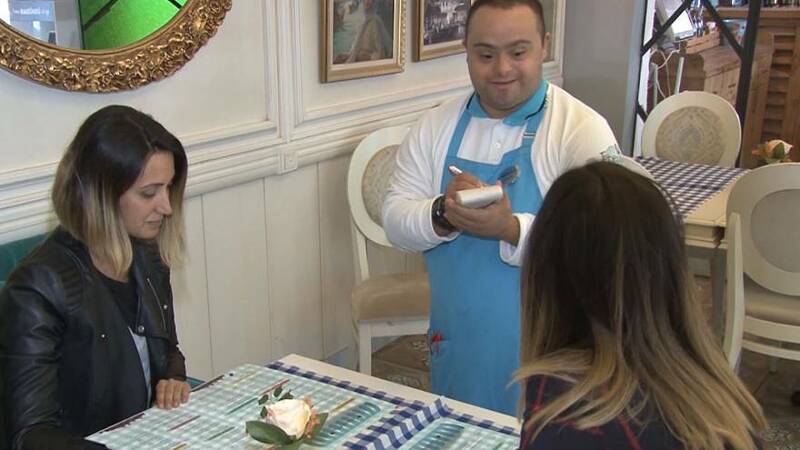 Şermin Çoban, the project coordinator behind the cafe, said the initiative has proved there is nothing that people with Down syndrome cannot do.